As anyone who uses it knows, Autocorrect can lose you clients and friends. It’s an equal opportunity offender. Autocorrect hates you. 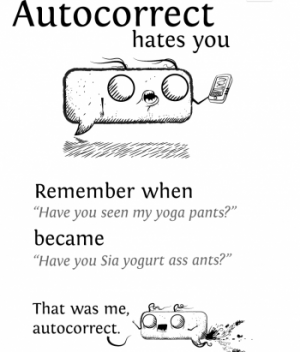 Matthew Inman, creator of The Oatmeal – alternately hilarious, poignant, cringeworthy and adorable, sometimes simultaneously – compiled some of Autocorrect’s most riotous mistakes on his blog in a post entitled Autocorrect Hates You. Guaranteed, you’ll recognize some of these.